The new Swift, shown, is longer and taller than the current model. TOKYO (Reuters)-- Suzuki Motor Corp. said it wants to sell more than 2 million units of its remodeled Swift subcompact cumulatively worldwide. The Swift will likely reach cumulative sales of about 2 million units in its six years of sales by this November, CEO Osamu Suzuki said at the launch of the remodeled Swift hatchback. Suzuki said he wanted the remodeled version to surpass that. The Japanese automaker has updated the Swift to make it 10mm taller and 90mm longer than the current model. The new-generation Swift, whose design is similar to the current model, also has improved fuel consumption and significantly lower emissions as well as better safety and driving performance. 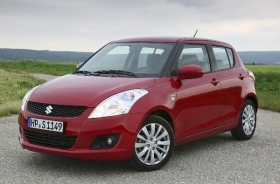 The new Swift will go in sale in Europe shortly after its debut in Paris as three- or five-door variants. It will continue to be built for European markets in Suzuki's factory in Esztergom, Hungary. The Swift will offer a 94-hp 1.2-liter gasoline engine that's slightly more powerful than the 1.3-liter unit it replaces, using variable intake and exhaust valve timing technology to improve fuel economy to 5 liters per 100km and reduce CO2 emissions by 17 percent to 116 grams per kilometer. A new 75-hp 1.3-liter diesel variant uses 4.2 l/100km of fuel and cuts CO2 emissions by 9 percent to 109g/km. Extensive use of higher strength steel makes the new car lighter and stiffer than before as well as offering refinement in underbody design, the automaker says. The latest body structure has also helped improve impact safety for pedestrians as well as occupants.